The year 1984 has come and gone, but George Orwell’s novel continues to haunt our collective imagination. When I first read it years ago, soon after its first appearance, Orwell’s classic had a powerful impact on my adolescent mind. How, I naively wondered, could the whole world be governed by a system based on fantastic but ingenious lies? I’ve grown less naïve since that early time, but Orwell’s book has continued to shape my thinking. His frightening vision of the mind-bending powers of mass media engaged most directly with malign political manipulation, but it can relate as readily to the not-so-hidden persuaders who produce the great modern avalanche of commercial advertising. The televisual gimmicks used to “sell” the Ingsoc regime’s Two Minutes’ Hate to a brainwashed audience eerily anticipate, with their inflammatory images and abrupt dissolves, the commercials for cars, detergents and the like we’re all accustomed to seeing ad nauseam on our TV screens. That’s one reason why I’d count Orwell as a governing influence on my book Designing Fictions, and especially on its treatment of the social and fictional repercussions of advertising. Those repercussions were the main concern of a less celebrated Orwell novel: Keep the Aspidistra Flying, written a dozen years before Nineteen Eighty-Four. The young protagonist, Gordon Comstock, has thrown over his job as an advertising copywriter, an occupation for which he has a singular knack but which arouses in him a violent revulsion. (“Look at that bloody thing up there!” Gordon exclaims a propos of a billboard he especially loathes. “Doesn’t it make you spew?”) What above all excites Gordon’s wrath – as it excited Orwell’s – is the dishonesty of such persuasion-for-gain. This is a theme found consistently in fictional accounts of advertising as a practice, as far back as H. G. Wells’s brilliant 1909 exposé Tono-Bungay, and as recently as the hit television series Mad Men, whose central character, the Creative Director Don Draper, leads a life founded on falsehoods, up to and including the facts of his personal history. The tragic irony of Gordon’s life is that, to survive, he is forced to abandon his attempt to pursue a career as a poet – which for Orwell meant being a professional truth-teller – and to backslide to his old job as a copywriter, a teller of lies for profit. His decision amounts in terms of a metaphor writers have regularly applied to the business of advertising, to a form of self-prostitution. What may at first blush strike one as surprising is that when Orwell came to write Nineteen Eighty-Four his take on advertising seems to have mellowed a bit. When the main character, Winston Smith, is offered a glass of (regime-proscribed) wine by the faux-dissident O’Brien, he has a flashback to an electric billboard that beguiled him as a child, “a vast bottle composed of electric lights which seemed to move up and down and pour its contents into a glass. Seen from the top the stuff looked almost black, but in the decanter it gleamed like a ruby.” Looking back as it does to an era before the harsh postcapitalist Ingsoc regime, the memory has a poignant aura of nostalgia. Does this suggest that Orwell, by the end of his too-brief life, had “softened” toward the whole apparatus of commercial promotion? It’s true after all that, like any writer, Orwell depended on advertising to make his own work known and appealing to the public; it’s hardly surprising that his attitude toward it might be ambivalent, rather than wholly negative. More than that, though, I think that he simply came to view advertising as the lesser of two evils – the greater evil being, for him, pernicious political propaganda. What he couldn’t have envisioned, when he wrote his dystopian bestseller, was the overwhelming persuasive power and outreach of the modern corporate promotional industry, its insidious techniques for moulding the sensibilities and beliefs of its targets. If he had foreseen that, he might not have made the ruby red liquid in Winston’s fondly recalled wine glass sparkle quite so alluringly. Obviously, few would claim that selling, say, toothpaste is as bad as “selling” Nazism or Stalinism; but there are continuities of method that can shade into continuities of substance. Advertising can persuade the public to consume products that are by no means as harmless as toothpaste: tobacco, petrol-guzzling mega-vehicles, the whole compulsive mind-set of consumerism itself. And that explains why, whenever I happen to look forward to the hyper-Orwellian year 2084, my own fingers are crossed. 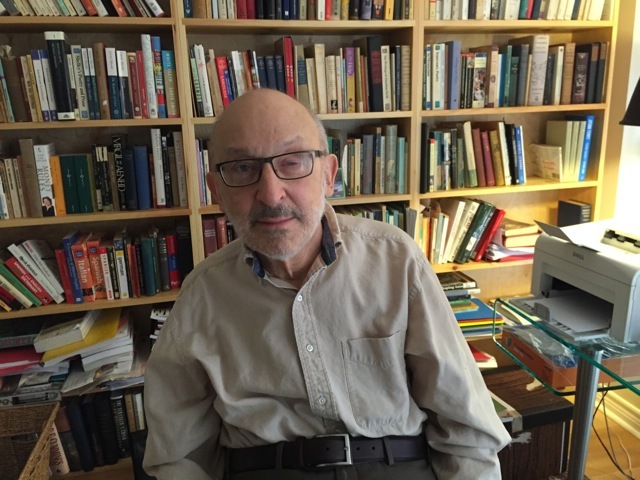 Michael L. Ross is professor emeritus of English and Cultural Studies at McMaster University. His book Designing Fictions is published in May 2015 by McGill-Queens University Press. The image used at the beginning of this post is by Oblivious Dude.